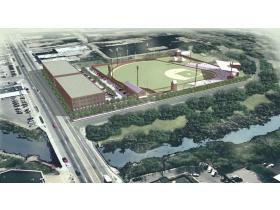 A rendering of baseball park at the city's Water Street site was presented to the community at the meet and greet last evening. The rendering was created by FX Architecture, of Royal Oak. Apr. 9, 2009 · 4:22 p.m. The Midwest Sliders of Ypsilanti hosted a meet and greet for all community members Wednesday, at Frenchie’s Restaurant in Depot Town. Community members were able to come and interact with team officials and players. Team President Rob Hilliard was impressed with the turnout. With a drawing of what a baseball stadium in downtown Ypsilanti may look like on display, the future of baseball was also a hot topic. Architect Frank X. Arvan, with Royal Oak FX Architecture LLC, said the the ballpark at Water Street was designed to "fit into the historic context of Downtown Ypsilanti and to create a new civic experience for the City. "Inspired by the simplicity and integrity of early 20th century millennium architecture, the new Park will be an active destination for Downtown visitors and have the latest in green construction materials and methods," he said. Some “green” elements that could be incorporated into the park’s construction include: waterless urinals, recycled content roofing, minimal excavation - reuse spoils to balance the site, recycled content seating and recycled content turf. he also said most materials would be manufactured within 500 miles of the site. "It's a building that's all about the public," he said. Manager Eric Coleman feels this city will embrace a team to call their own, and is anxious for the season to start next month. Hilliard feels that this will left the city, and give the people something to be proud of. The Sliders home opener is May 20. All home games will be played at Eastern Michigan University’s Oestrike Stadium.